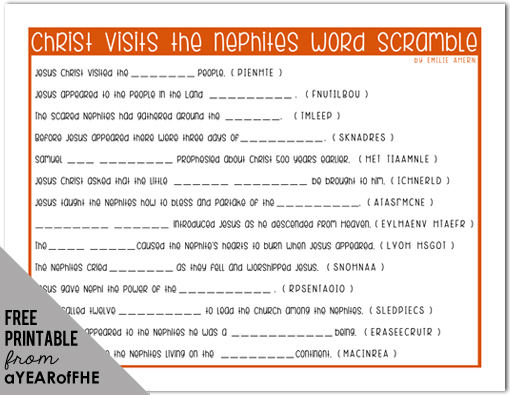 What You'll Need: scriptures, GAK 315: Jesus Christ Appears to the Nephites, GAK 316: Jesus Teaching in the Western Hemisphere, GAK 317: Jesus Healing the Nephites, GAK 322: Jesus Blesses the Nephite Children, Downloaded video of My Joy is Full on your computer or burned onto a DVD, printed coloring page and coloring supplies. Scripture: John 10:16 - And other sheep I have, which are not of this fold: them also I must bring, and they shall hear my voice; and there shall be one fold, and one shepherd. After Jesus was killed and resurrected in Jerusalem, he told his disciples "...other sheep I have, which are not of this fold: them also I must bring, and they shall hear my voice..." Christ was telling his disciples that he would visit his righteous people on the American Continent. The people on the American continent are those that we read about in the Book of Mormon. When Christ died and was resurrected there were signs where the Nephites lived. Many Nephites gathered at the temple in Bountiful. They were talking to each other about Jesus Christ and the sign of his death. While they were talking, they heard a quiet voice from heaven. It made their hearts burn. At first they could not understand it. The third time the voice spoke, they were able to understand it. Jesus told the people to come and feel the marks in his hands and feet where he had been nailed to the cross. Jesus wanted them to know that he was who he said he was, that he had died for everyone’s sins and had been resurrected. One by one the people felt the nail marks in Jesus’ hands and feet. Jesus wanted them to know for themselves that he was Jesus Christ. We have been promised that we can also know him like they did, but instead of touching his hands, we can feel the Spirit testify to us. 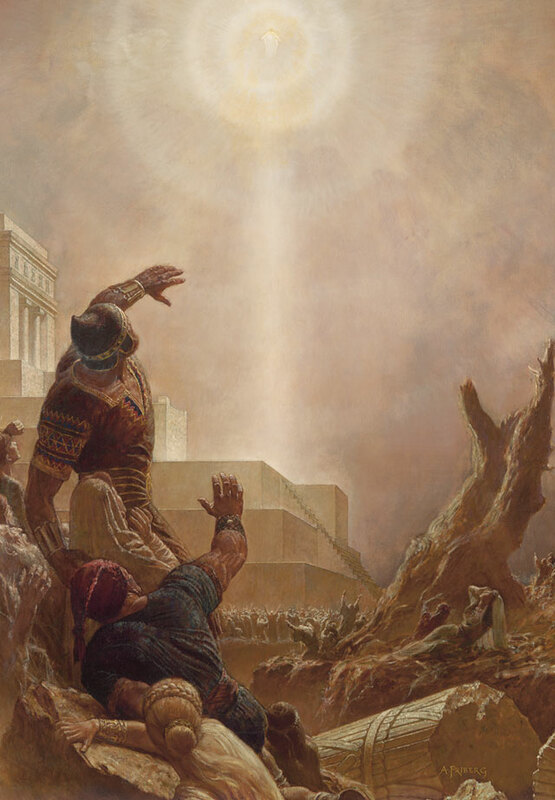 President Joseph F. Smith, then a counselor in the First Presidency, said, “The Holy Spirit of God has spoken to me—not through the ear, not through the eye, but to my spirit, to my living and eternal part,—and has revealed unto me that Jesus is the Christ, the Son of the living God”. 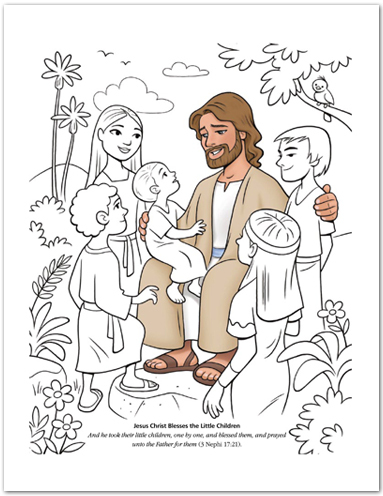 The people testified that he was the Savior of whom the prophets had written. They fell at Jesus’ feet and worshiped him. Jesus gave righteous men the Priesthood and taught the people many things. 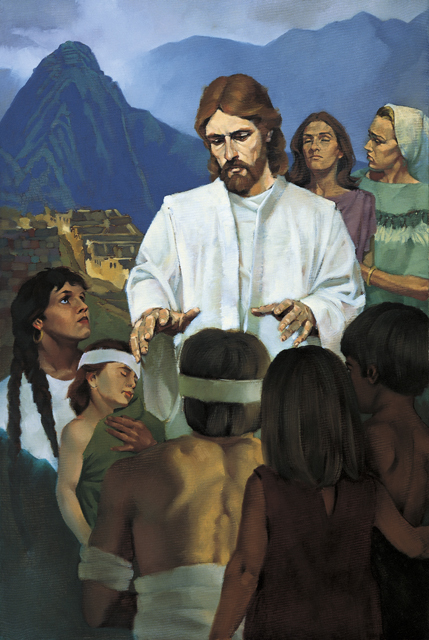 Jesus loved the Nephites. He told them to bring the people who were sick or hurt to him so that he could heal them. Jesus healed these people, and all the people bowed down and worshiped him. 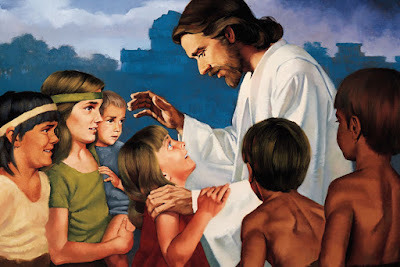 Before he left, Jesus asked that the children be brought to Him so He could bless them and pray for them. As the Nephites watched, the heavens opened and angels came down and circled the children; the children looked as if they were being circled by fire. Bear your testimony about the divinity of Jesus Christ and how you gained a testimony. Make sure you describe what physical sensation you have when the Spirit is testifying to you. Testify of the Book of Mormon's truthfullness. Thanks so much! I'm going to use the photos by Mark Mabry to go along with this lesson! Excited!! Thank you so much for all the hard work you put into these lessons. It makes it way easier for me to have family home evening when sadly I might otherwise not! You are making a difference! Thank-you so much for all your hard work, we really LOVE this website! We left our tree of life pictures up on our wall from lesson 2 and I have had many people comment on it and I have sent them to your blog because it is awesome! Thanks so much for another lesson. I am glad you decided to continue for another year. Our family used the lessons frequently last year. Thank you we are having another family over and I needed a quick lesson that was good! I found it here! We missed the week that this lesson was for (my husband is in med school and had to stay late that week), so we didn't do this lesson until this past Monday. I had mentioned before how nervous I was showing a video to my kids because they are so young. Well they loved it! It brought tears to my eyes to see my 2 yo watching and commenting on how "Jesus is making her eyes all better!" and that "Jesus loves those boys and girls!" Even my 1 yo pointed and said, "Jesus!" Thank you, once again, so much for this lesson! Thank you for posting these lessons. 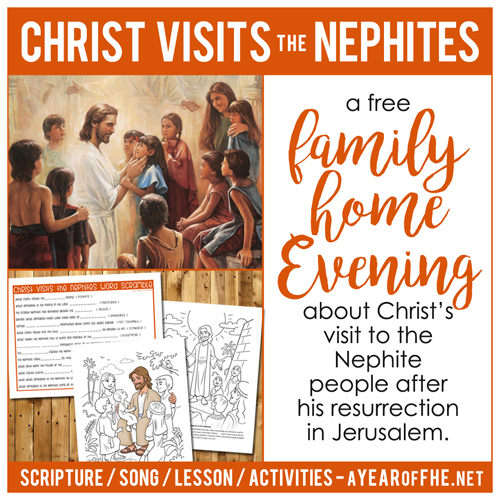 We are reading 3 Nephi in our family scripture study, so this will be a great FHE lesson tonight. 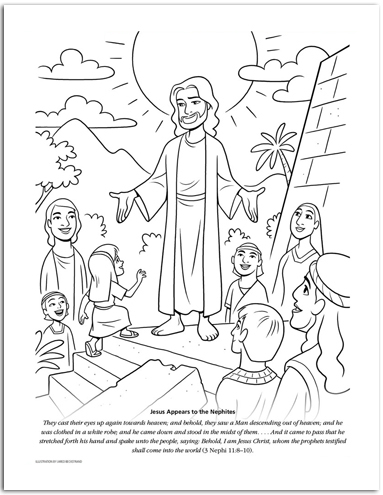 I love the video and coloring sheet, they are a great addition. Thank you for these lessons! They are great! I only have a 3 and 1 year old, so I will probably be condensing the lesson...the video and coloring sheet will be great, though! Thank you so much! I LOVE your lessons and they are wonderful for families with small children! Thank you Thank you!